A new traffic pattern with a unique twist will open above Interstate 66 in Haymarket ahead of schedule, according to the Virginia Department of Transportation. UPDATE: Jan. 25, 2017 – Because of inclement weather, the interchange opening has been delayed until Jan. 28, 2017. HAYMARKET, Va. — A new traffic pattern with a unique twist will open above Interstate 66 in Haymarket ahead of schedule, according to the Virginia Department of Transportation. VDOT says Northern Virginia’s first diverging diamond interchange will open to traffic on or about Dec. 17. Instead of traveling straight forward, drivers on U.S. 15 will be sent to the left of opposing traffic. “Traffic will be to the right of you, so that’s a little unique — kind of like driving in England,” said VDOT Design Build Program Manager Christiana Briganti-Dunn. “On Route 15, traffic will actually cross over into the opposite side of the road between the signalized intersections that control the ramps. The southbound and northbound traffic will travel on the opposite side allowing then free-flowing left turning movements onto the interstate,” Briganti-Dunn said. Studies show the bow-tie design and elimination of left turns into oncoming traffic moves more vehicles and boosts safety. “It can improve traffic efficiency by over 30 percent and it can reduce traffic accidents by 50 percent or more. 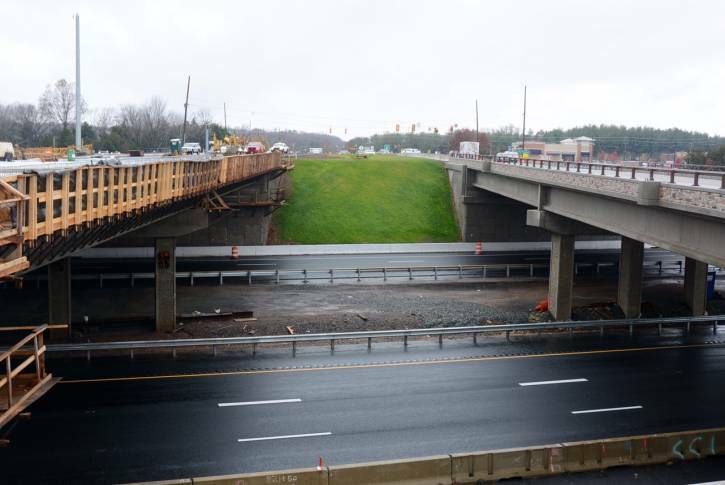 The number of conflict points, or the opportunities for where vehicles could impact one another, is reduced from 30 in a standard diamond interchange down to 16 in this diverging diamond interchange,” Briganti-Dunn said. The crashes that do occur are generally less severe given the geometry of the lanes and ramps, Briganti-Dunn said. Two sets of traffic signals will tie the northbound and southbound lanes of U.S. 15 together on each side of I-66. VDOT said that the signals will work in tandem, moving twice as many vehicles through the interchange as the old junction. Traffic will travel across I-66 on two separate bridges. The newer bridge and the new traffic pattern are scheduled to open on Dec. 17 if weather remains favorable, but construction will continue through next spring. The $59 million project encompasses the nearby Heathcote Boulevard and Va. 55 (Washington Street) intersections. The entire project is expected to be finished by early next summer.